Recently, I made a post on Remove Antivirus Software easily using Removal Tools which lets you to remove your Antivirus software easily from your computer. Norton has introduced the latest version of their removal tool. The Norton Removal Tool is an official application from Symantec which is designed to remove Norton software from your computer. 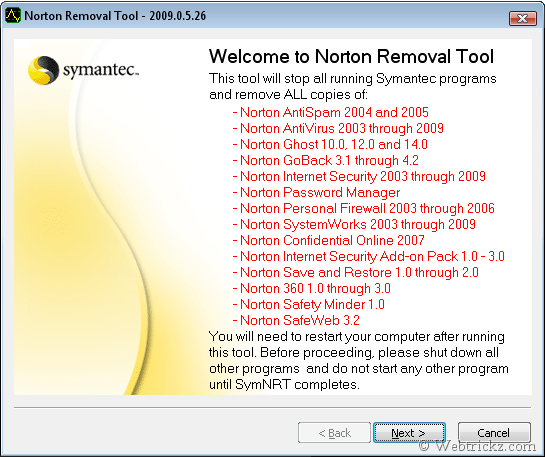 The Norton Removal Tool uninstalls all Norton 2009/2008/2007/2006/2005/2004/2003 products, Norton 360 and Norton SystemWorks 12.0 from your computer. You may need your Product Key when you reinstall your Norton product.